With a whole host of awards and accolades under its belt, Orange is the New Black is one of the most popular and most critically acclaimed Netflix original series. It won three Primetime Emmys in 2014 alone, and now it’s returned for its third season. 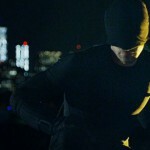 If you’re reading this, you may have already binge-watched your way through all the new episodes (Netflix released them to the world late on June 11). Since it’s one of our favorites, too, here are few easy ways to make your own Orange is the New Black costumes. Not only do we love us some OitNB because of the show itself, but we love how easy the costumes are. 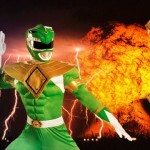 After all, 90% of the characters wear 90% identical outfits, 90% of the time. So, we’re just going to show off the basic prisoner look, which, when combined with the right signature accessories or wigs, can represent any of your favorite characters. This orange prison jumpsuit looks just like Chapman’s uniform when she first arrived at Litchfield, before she gets her khakis like everyone else. Yes, we know it’s a male model in the photo, but trust us – it’s totally unisex. Speaking of which, here are the khakis in question. Most of the prisoners throughout the show are seen in this plain beige jumpsuit. Whichever color you prefer to wear while doing your time, complete your costume with black boots, a clip-on ID badge, and a white undershirt. Once you have the basics down, choose your character and accessorize accordingly. Piper Chapman: A short blonde wig will give you Piper’s signature look. Alex Vause:Mimic Alex’s haircut with a black wig and a pair of thick-rimmed glasses. Suzanne “Crazy Eyes” Warren: Suzanne’s Bantu knot hairstyle is one of most unique things about her (and that’s saying something). Here’s just one of the many Crazy Eyes hair tutorials we were able to find on YouTube. Nicky Nichols: If you have long enough hair, just frizz it up and you’re good to go. Lorna Morello: A short black hairstyle, some makeup, and some more makeup will nail Morello’s look. Of course, not every Orange character wore the same thing all the time. Keep on reading for more ideas about a few specific fan favorites. Unlike many of her fellow inmates, Red often wore a different uniform during her time at Litchfield: a chef’s jacket and gray pants. Her work detail eventually moved out of the kitchen, but it’s still her most recognizable role. Hang some glasses from a chain around your neck, don a short red wig, practice your Russian accent, and you’re good to go. 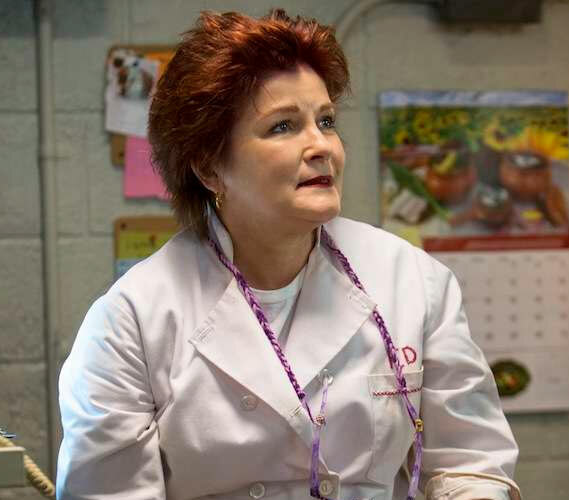 Even if it’s not quite as good or as terrifying as Kate Mulgrew’s, the accent will help you stay in character. Inmate Tiffany Doggett, or “Pennsatucky,” wears the same prison uniform as all of the other Litchfield inmates, but a couple of accessories that set her apart are the plain gray hoodie that she always has dons, and her heavily decayed teeth (turns out, meth is bad for you). A Bible, or any book with a DIY “Bible” cover, makes a great costume prop for her, too. 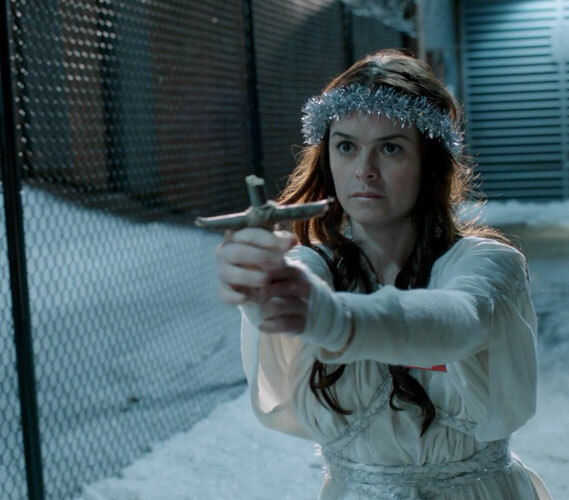 ‘Tucky was also part of the ultimate scene in season one of Orange is the New Black, in which she plays an angel in the prison Christmas pageant. To get that look, wear a basic gray dress, and fashion a DIY angel halo out of some wire (like an old coat hanger) and silver tinsel garland. You’ll also need a makeshift crucifix, made from a couple sticks. Make sure one end is nice and pointy. He may not be a main character, or even a prisoner – really, he’s more of a villain than anything – but we simply couldn’t ignore Pornstache. 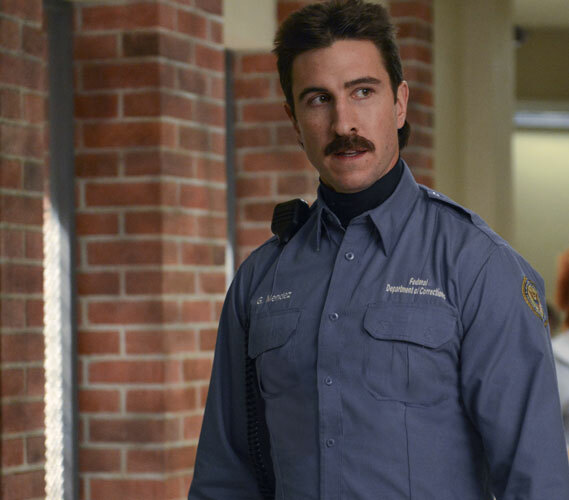 That nickname is just too good, and actor Pablo Schreiber does an amazing job at making him one of the most memorable characters on the show, even if he is slightly, you know, morally appalling. Clearly, the most important part of any Pornstache costume is the mustache itself. Here’s a pack of disposable, peel-and-stick fake mustaches that will do the trick. You can trim them with a pair of scissors to fit your face, too. The bulk of the costume can be put together with black pants and a blue button-down shirt; get one from the thrift store, if necessary. Mendez is also usually seen with a black turtleneck, handcuffs and a black belt, and a shoulder microphone or walkie-talkie are essential accessories. Most of the pieces that go into this Pornstache costume idea are applicable to the other Litchfield prison guards, too. Sam Healy, Susan Fischer, and John Bennett all have the same blue shirt, black pants, and equipment. So, if you and some friends are looking to put together some Orange is the New Black group costumes, that’s a great way to go. Are you already caught up on new Orange is the New Black episodes? What kind of costume ideas should we talk about next? 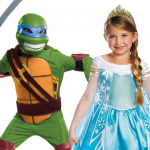 Find us on Facebook and on Twitter @BuyCostumes to share your thoughts, and check out our Pinterest boards for more costume ideas, too.